Heydar Alirza oglu Aliyev was born on 10 May 1923 in the town of Nakhchivan, Azerbaijan. In 1939, after graduating from the Nakhchivan Pedagogical School, he studied at the architectural department of the Industrial Institute of Azerbaijan (now the Azerbaijan State Oil Academy). The war impeded to complete his education. Since 1941, Heydar Aliyev was the head of the department at the People's Commissariat of Internal Affairs and People's Commissariat of Soviet of Nakhchivan Autonomous Soviet Socialist Republic and in 1944 he was sent to work in the organs of the state security. Working since then in the organs of state security, Heydar Aliyev held the post of the deputy chairman of the State Committee of Security, and since 1967 - its chairman. He was conferred the rank of lieutenant general. In these years, he received a special higher education in Leningrad (now St Petersburg), and then in 1957 he graduated from the department of history of Azerbaijan State University. Being elected as the First Secretary of the Central Committee of the Communist Party of Azerbaijan in 1969, Heydar Aliyev headed the Republic. In December 1982 he was elected an alternate member of Political Bureau of the Central Committee of the Communist Party of the Soviet Union and appointed the first deputy chairman of the Cabinet of Ministers of the USSR, thus he became one of the leaders of the USSR. During twenty years, Heydar Aliyev was a member of parliament of the Supreme Soviet of the USSR and for five years deputy chairman of the Supreme Soviet of the USSR. In October 1987, Heydar Aliyev, as a protest against the policy pursued by the Political Bureau of the Central Committee of the Communist Party of the Soviet Union and personally by the Secretary-General Michael Gorbachev, he resigned from his post. In connection with the tragedy committed on 20 January, 1990 in Baku by the soviet troops, Heydar Aliyev appeared at the Azerbaijan Representation in Moscow on the next day with a statement, demanded to punish the organizers and executors of the crime committed against the people of Azerbaijan. As a protest against the hypocritical policy of the leadership of the USSR, in connection with the critical conflict in the Mountainous Garabagh, in July, 1991, he left the ranks of the Communist Party of the Soviet Union. After his return in July, 1990, to Azerbaijan Heydar Aliyev lived first in Baku, then in Nakhchivan, and in the same year he was elected as a deputy to the Supreme Soviet of Azerbaijan. In 1991-1993 he held the post of the chairman of the Supreme Soviet of the Nakhchivan Autonomous Republic, Deputy Chairman of the Supreme Soviet (parliament) of the Republic of Azerbaijan. In 1992, at the constituent congress of the New Azerbaijan Party in Nakhchivan, Heydar Aliyev, was elected chairman of the party. In May-June, 1993, when as the result of extreme tension in the governmental crisis, the country was on the verge of a civil war and loss of independence, the people of Azerbaijan demanded the return Heydar Aliyev to power. The then leaders of Azerbaijan were obliged to invite officially Heydar Aliyev to Baku. On 15 June, 1993, Heydar Aliyev was elected as chairman of the Supreme Soviet of Azerbaijan, and on 24 July - on the resolution of the parliament, he began to perform the powers of the President of the Republic of Azerbaijan. 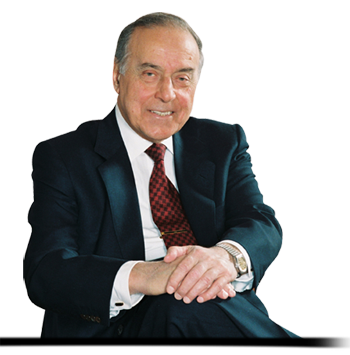 On October 3, 1993, Heydar Aliyev was elected President of the Republic of Azerbaijan. On October 11, 1998, having joined at the elections, held in conditions of great activity of the population, he won 76,1 per cent of the votes and was re-elected President of the Republic of Azerbaijan. Giving his consent to be nominated as a candidate in the 15 October, 2003 presidential elections, he decided not to run at the elections in connection with problems in health. Heydar Aliyev was conferred on a number of international awards, the title of the honorary doctor of numerous universities, and other high honors. He was conferred on for four times with the Lenin Order, the Order of Krasnaya Zvezda and many medals, and twice Hero of the Socialist Labor, awarded by Orders and medals of many foreign states. Historical destiny of Azerbaijan, covering the period of over the last thirty years, was inseparably linked with the name of Heydar Aliyev. Revival in these years in all the spheres of socio-political, economic and cultural life is connected just with his name. During the said period, Heydar Aliyev helped his native Azerbaijan, he persistently strived for progress. He was always proud of the rich culture and great historical past of the country. He was concerned about the future generations and made Azerbaijan overcome hard and terrible ordeals of time. Being an outstanding politician and statesman, indisputable leader of the nation, he was a live legend, and therefore, Heydar Aliyev as a phenomenon always attracted the attention. Because of his political activity leader of the Azerbaijanis of world was admired by everybody his life and activity were and was widely illuminated both in the Republican and the world press. Heydar Aliyev, seeing the misfortune of his nation, accepted the invitation and returned to great politics in Azerbaijan. People welcomed his return with hope and joy, and this day went down into history of the independent Azerbaijan as the Day of National Salvation. “...Our scientists, experts have discovered big oil and gas deposits in the Azerbaijani Sector of the Caspian Sea. We are ready to cooperate with the world's biggest companies on joint development of those deposits. Azerbaijan is open to and for integrating into the world economy. We are ready to cooperate with any country and company interested in our country...”. At the opening of the Olympic Center at Mashtaga, Baku. December 29,2001.